Fun Reception with food and live music. 5:30 to 7:30 on Thursday, October 16, 2014. One of my artworks was juried into the show Animalia, curated by June Sekiguchi, and will be on exhibit from October 16, 2014 to February 14, 2015. 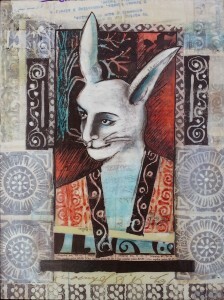 This entry was posted in and tagged Animalia, Art, Collage, ERA, Flying Redhead, June Sekiguchi, Lynette Hensley, Rabbit, Shaman on October 16, 2014 by Lynette Hensley.